Manufacturer of a wide range of products which include brilliant 2t oil. Brilliant 2t Engine Oil is low synthetic two stroke engine oil developed to meet the critical requirements of high performance two stroke engines manufactured by leading auto makers. It is blended from selected base stocks and additives to minimize spark plug fouling and preignition, prevent rusting, minimize deposit formation and provide protection against seizure, scuffing and wear. It contains a diluent for easy mixing with gasoline. Brilliant 2T Oil is green dyed product. 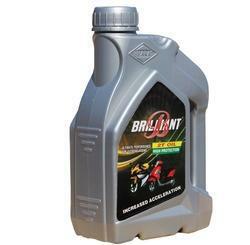 Brilliant 2T Oil is recommended for lubrication of scooters, auto rickshaws, motorcycles and mopeds operating on two stroke engines. The recommended dosage of Brilliant 2T Oil is 20 ml of oil per litre of petrol.